Entrepreneurship is a hot topic in academic, managerial, and policy circles. Yet researchers and policymakers tend to define entrepreneurship narrowly as business start-ups, and entrepreneurs as young dreamers with a particular personality. In fact, as Peter G. Klein argues, entrepreneurship is a far broader, pervasive, and more important phenomenon in the market and in the free society. Klein is one of the stars of the Austrian School today, with a specialization in an area in which the Austrians make a unique contribution: the entrepreneur's role society as the driving force of the market. The last major work on this topic appeared in 1973 with Kirzner's own book on entrepreneurship. Klein's own book, as Peter Lewin has written, offers "a fresh, immensely revealing perspective." 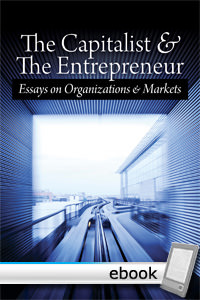 In Capitalists and Entrepreneurs, Klein rehabilitates and expands the classical concept of the entrepreneur as a judgmental decision-maker, linking the capitalist-investor and the entrepreneur-promoter. Building on foundations laid by the Austrian school of economics, Frank Knight’s theory of uncertainty, and the modern economics of organization, Klein shows how an entrepreneurial perspective sheds light on firm size and structure, corporate governance and control, mergers and acquisitions, organizational design, and a host of managerial and financial problems. He also offers a reinterpretation of the modern Austrian school and a critique of the “opportunity-discovery” perspective in modern entrepreneurship studies. In a series of shorter essays he tackles the economics of the Internet, network theory, the socialism of the intellectual class, the financial crisis, and the contributions of Carl Menger, F. A. Hayek, and Oliver Williamson. Peter G. Klein is an Associate Professor in the Division of Applied Social Sciences at the University of Missouri, Adjunct Professor at the Norwegian School of Economics and Business Administration, and Senior Scholar of the Ludwig von Mises Institute. His research focuses on the boundaries and internal organization of the firm, with applications to diversification, innovation, entrepreneurship, and financial institutions. He is author or editor of four books and author of over fifty scholarly articles. Klein holds a Ph.D. in economics from the University of California, Berkeley and a B.A. from the University of North Carolina, Chapel Hill. He blogs at organizationsandmarkets.com. Even today, social scientists and historians continue to treat the Industrial Revolution as if it were the beginning of the end of civilization. Thomas DiLorenzo has a marvelous analytical talent and a knack for drawing the reader's attention to the material that matters. Chamberlain was a great writer who could see both the big and little pictures. Foss, Nicolai J. and Klein, Peter G.